I had the opportunity to meet Karen Martini and I think she is a lovely lady and an amazing chef. I regularly surf her blog at http://karenmartini.com and I find her recipes are mostly quick to make and always tasty. This month the Florentine recipe caught my eye and I decided to make my Florentines with a mix of dark, milk and white chocolate bases because…….well everyone has their own favourite chocolate type. 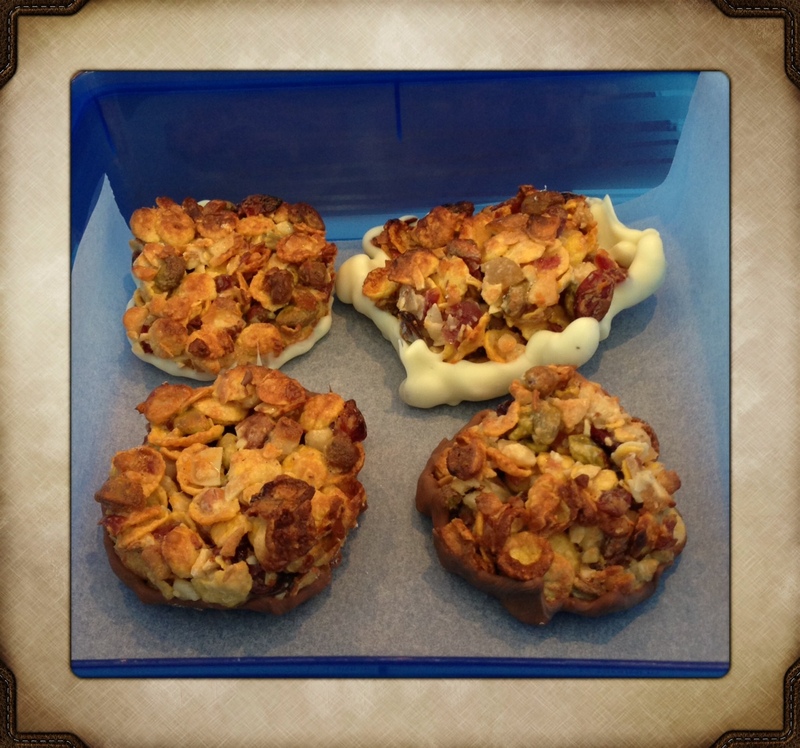 These Florentines are simple to make and are so so soooooooo yummy. Crisp corn flakes intermixed with bursts of berries with sweet condensed milk and undertone of decadent chocolate – hmmmmm you can’t go wrong. You can almost pass these off as healthy, with the nuts, berries and flakes of corn; just don’t mention the chocolate (however I’m sure somewhere in the world they are proclaiming the benefits of chocolate so you could strengthen your health food argument). Throw everything in a bowl, push the mix into a scone cutter and bake – 1 2 3! Nothing beats homemade biscuits, except maybe the Tim Tam, so find a little time this Sunday and treat the family. Preheat oven to 180°C. Line 2 or 3 trays with baking paper. Combine all ingredients except chocolate in a large bowl and stir well. Put 7cm round scone cutter on lined tray, press 1-2 tablespoons of mixture into cutter, then repeat for rest of mixture. Bake for 10-12 minutes or until golden. Remove and cool on wire racks. Melt chocolate in a heatproof bowl over simmering water; spread on back of each biscuit. Leave to set for 20 minutes. Complexity Rating: – Basically child’s play! I’d be eating the mixture before it went into the oven! That’s why I make a little extra. Of course tasting is a very important part of cooking and you need to check quality as you go -he, he!